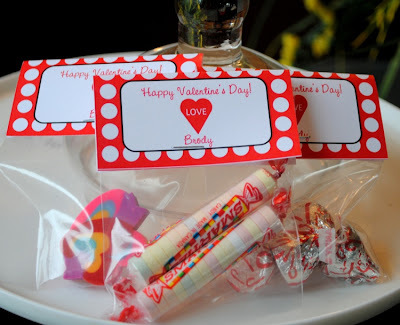 So I am in the middle of finishing touches for Skylar's birthday party and since her colors are red, black, and white, I thought I could use part of her birthday designs to incorporate into Valentine's Day labels for Brody to give out to his preschool class. Aren't these little favor bags so cute? The bags I used are standard 3" x 4" mini favor bags that you can purchase at any craft store (I bought a jumbo pack either at Michaels or Jo-Ann). Brody and I haven't decided what to give to his friends yet, but he wants to give out something sweet. I put some Smarties, Hershey Kisses, and an eraser in 3 different bags just to test it out for the picture above. But you can put in any small items like friendship bracelets, small cookies, small toy figures, stickers, etc. 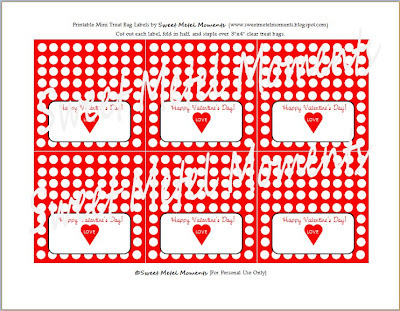 Since I am so grateful to those of you who read my blog, I wanted to make these labels available to you! Don't worry, Brody's name won't be on your labels. They are blank where his name is so you can fill that in yourself. Download your free DIY label HERE. And then staple over the bag filled with a treat! Enjoy! This is cute! Thanks for sharing! Thanks for sharing! These are super cute. These are so cute! I'm going to print these out for my little girls pre-school class. Can you tell me where you were able to find bags that small though?? Thanks! I got the bags at Joann or Michaels, can't remember exactly, but both stores sell them. They are the 3x4 clear treat bags, and they are usually near the candy melts section, where they also sell lollipop sticks and other clear bags. Great Valentines Day treat ideas Iris!! Any way I can print my daughter's name where Brody's was? So glad you like them! Unfortunately the file is a non-editable PDF file, but if you are interested in having me create a custom file for your daughter for a small fee through my Etsy shop, then drop me a note! My email address is sweetmetelmoments [at] gmail [dot] com.